Throughout his career, the Nobel Prize winner Mario Vargas Llosa has grappled with the concept of Latin America on a global stage. Examining liberal claims and searching for cohesion, he continuously weighs the reality of the continent against the image it projects, and considers the political dangers and possibilities that face this diverse set of countries. Now this illuminating and versatile collection assembles these never-before-translated criticisms and meditations. Reflecting the intellectual development of the writer himself, these essays distill the great events of Latin America’s recent history, analyze political groups like FARC and Sendero Luminoso, and evaluate the legacies of infamous leaders such as Papa Doc Duvalier and Fidel Castro. Arranged by theme, they trace Vargas Llosa’s unwavering demand for freedom, his embrace of and disenchantment with revolutions, and his critique of nationalism, populism, indigenism, and corruption. 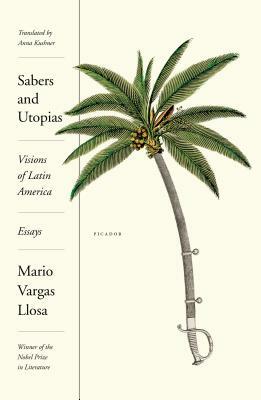 From the discovery of liberal ideas to a defense of democracy, buoyed by a passionate invocation of Latin American literature and art, Sabers and Utopias is a monumental collection from one of our most important writers. Uncompromising and adamantly optimistic, these social and political essays are a paean to thoughtful engagement and a brave indictment of the discrimination and fear that can divide a society.